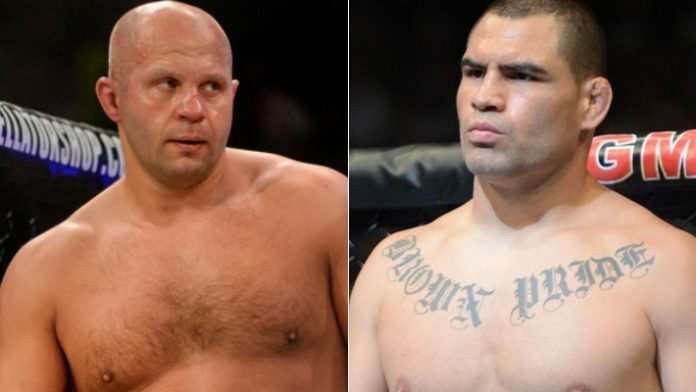 There’s no doubt that Cain Velasquez and Fedor Emelianenko are two of the greatest heavyweights in mixed martial arts (MMA) history. Velasquez is a two-time UFC heavyweight champion and has shown to have one of the most versatile skillsets the division has ever seen. During his heyday, Emelianenko was a dominant force who strung together a win streak of over nine years. Of course, both Velasquez and Emelianenko’s days of being undefeated are over. “The Last Emporer” currently has five losses on his MMA record. He is, however, set to challenge Ryan Bader for the vacant Bellator MMA heavyweight championship on January 26th. As for Velasquez, he has only lost twice in his career – once to Junior dos Santos and the other to Fabricio Werdum. He’s currently preparing to make his Octagon return after two years on February 17th. “I don’t really have a one greatest. I do believe him and Cain are two of the greatest heavyweights of all time,” Bader said. “Just from what he’s done, he has this mystique about him, he doesn’t let too many people into his personal life. What do you think would happen if Velasquez and Emelianenko shared the cage?